So here it is. After paying homage at the altar of Monty and making numerous fruit offerings to the Divine Fowler Goddess, I finally have my plan for this year. What veg do we enjoy most? What have I not grown before and fancy having a go at? I’ll plant, see what takes and reassess at the end of the season bearing in mind I don’t know what grew in the plot previously and haven’t got a clue how the soil will respond to my efforts. I’m sure as I put plan to soil it will evolve and change. Some ideas will get lost on this journey whilst new inspiration will be discovered along the way. ‘But Ade!’ I hear you cry, ‘What about a summer salad?’ Fear not my friends, the much-loved salad leaf, tomato and cucumber will continue to grow in the back garden, along with our herbs and berries. You’re getting to know a man who can never refuse a cheeky Ploughman’s (complete with salad garnish!) and I need these trusty fellows close by. So, no going back now; the blueprint has been drawn, the sleeves have been rolled up and this keen gardener is itching to get out of the shed and onto the plot! Previous Need a little help? There is nothing like getting that plan sorted to feel like you are on your way! Wishing you a bountiful harvest! Wow your plot looks lovely and big, cannot wait to see how your plans come to fruition. Hopefully your plot isn’t as water logged as are, are over here lol! Hi Nessy, our plot isn’t that big actually – it’s a four pole plot which is a fraction smaller than a half plot. The drawing isn’t to scale! The land isn’t too water-logged thankfully, sorry to hear yours is suffering under the weather. Come on sunshine! Ah, the plotting and planning of the veg patch! It’s one of my favourite winter occupations…Tho for the last couple of years, I’ve been experimenting with a veg polyculture (grand name for ‘muddle’, in my case), so the planning has gone a bit by the wayside…! Oooh yes, we know a bit about polyculture from growing veggies in our small back garden over the past couple of years; our beans grew happily amongst the sweet peas, our beetroots under the roses, and our courgettes amongst the foxgloves! We really like this approach. 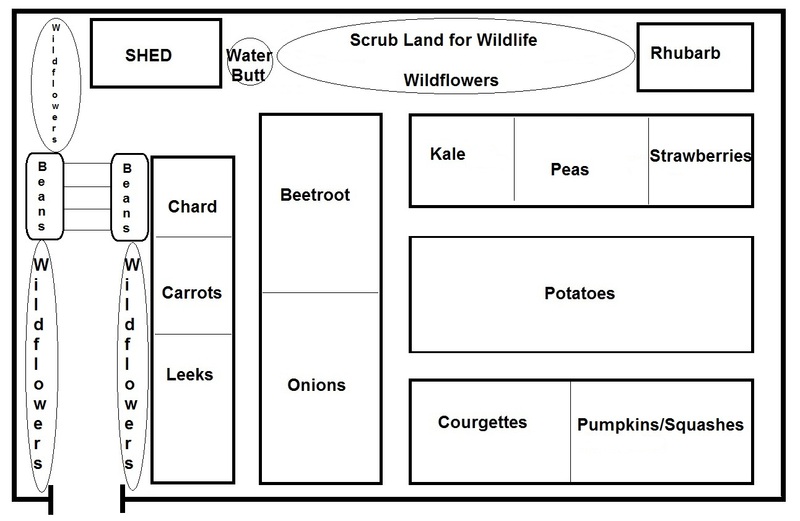 Having an allotment which is designated just for crops is a completely new challenge for us – we’ll see how it goes! I love your plan. Wished I was as organised.